Editor’s Note: As we telegraphed last week, we are moving GA-6 from Toss-up to Leans Republican and installing Rep.-elect Karen Handel (R) as a favorite for the 2018 midterm after her victory over former congressional aide Jon Ossoff (D). Additionally, we are moving SC-5 to Safe Republican after Rep.-elect Ralph Norman (R) won, though his three-point margin of victory was not nearly as strong as Donald Trump’s 18-point win there last November. Reacting to the GA-6 results this week is guest columnist Robert Wheel, who argues that the Democrats missed out on a golden opportunity by failing to capture GA-6. Demoralized and out of power but able to run against an unpopular president who is proving to be a poor manager, Democrats might be forgiven if there’s a tinge of déjà vu about the 2018 midterm elections. They faced a similar landscape back in 2006 — even down to the playing field tilted against them. In 2006, Democrats needed to net 16 seats for a majority, but there were only 18 Republican-held seats that John Kerry won in the 2004 presidential election. In 2018, Democrats will need 24 seats to win a majority, but there are only 23 Republican-held seats that Hillary Clinton won in the 2016 presidential election. In 2006, Democrats won 10 of the 18 Republican-held Kerry seats, about two-thirds of their way to the majority. Notably, the eight seats that Republicans retained were all manned by incumbents. Of those eight, three were won by Democrats the next time they opened up (DE-AL in 2010, NM-1 in 2008, and NY-25 in 2008), one Republican incumbent lost in 2008 (CT-4), and the remaining four were held by the GOP through when the districts changed in the next round of redistricting. Of those, two (WA-8 and PA-15) are still occupied by the same incumbent who survived the 2006 wave. Note: *TX-22 featured a write-in candidate for the Republican Party following the exit of former Rep. Tom DeLay (R) from the race. ^Tim Walberg (R) defeated incumbent Rep. Joe Schwarz (R) in the MI-7 GOP primary, so MI-7 is included as an open seat. Democratic nominees ran a median of 11 points better than John Kerry in these 21 races, winning eight of them (FL-13 was a narrow Republican victory — fewer than 400 votes). Only in CA-22, won by now-House Majority Leader Kevin McCarthy (R), did the Democratic House nominee not run ahead of Kerry. In other words, in their quest for a majority in 2018, Democrats may be able to afford to lose a few of the 23 districts that voted for Hillary Clinton. Some GOP incumbents like Reps. Dave Reichert (R, WA-8), Mike Coffman (R, CO-6), and Jeff Denham (R, CA-10), among others, are proven political survivors, just like Rep. Charlie Dent (R, PA-15) was in 2006 when he won by 10 points in a seat that Kerry narrowly carried. But Democrats don’t have that excuse for an open seat, even if it’s one that leans Republican. Which brings us to GA-6, and the Democratic disappointment it represents. This is a seat that Trump won by a point and a half but Romney won by 23 points. The electoral shifts between 2000 and 2004 were smaller than those of 2012 to 2016, so 2006 results are not all that instructive for a seat that changed to the degree GA-6 did. FiveThirtyEight’s weighted district average — three-fourths of the 2016 presidential result and one-fourth of the 2012 result — would posit that the baseline performance of a Republican presidential candidate is 9.5 points better than the 2016 national popular vote in this district, so about a seven point advantage for the Republican House candidate. Handel won by a little less than four points, so by that measure Ossoff did run ahead of the district’s presidential lean. Nonetheless, if Ossoff had run 11 points better (the aforementioned 2006 median) than the 2012-2016 weighted average, he would have won. That suggests that GA-6 is still the type of district that Democrats should flip even when using the weighted average. 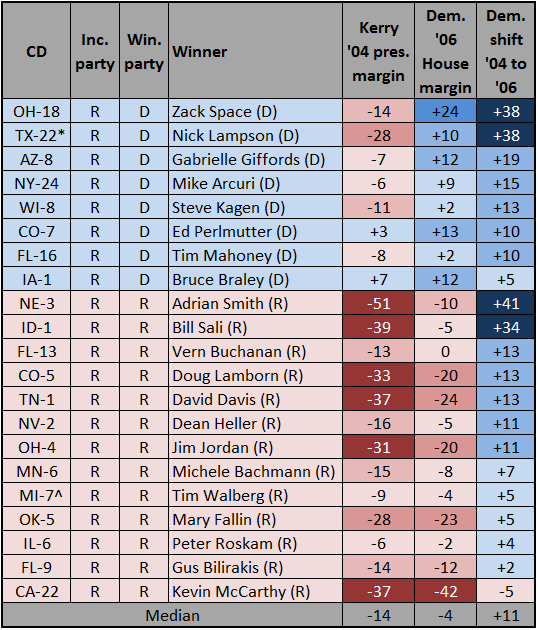 Looking at the 2006 open seats, the only one held by Republicans despite a Bush margin of seven points or fewer was IL-6. Then, Rep. Pete Roskam (R) was an established local politician and his opponent, now-Sen. Tammy Duckworth (D-IL), was an outsider (literally living a few miles outside the district) with an attractive backstory. So there were some parallels between Handel and Democratic nominee Jon Ossoff, who also did not live in his district. Roskam is still in Congress, representing a district (IL-6) that was won by the Democratic presidential nominee in two of the last three elections. Further, while the FiveThirtyEight weighted average takes past Republican performance into account, it’s unlikely that Bush was as unpopular in IL-6 in 2006 as Trump is in GA-6 today (nationally Trump’s approval rating right now is comparable to Bush’s in November 2006, but GA-6 is less Republican now than IL-6 was then). And there’s a good reason to discount the weighted average versus the actual 2016 numbers: Ossoff’s performance in the primary and the runoff, where he received 48% of the vote in both. If 2016 were some type of psychic break from reality (many people on both sides of the aisle wish it were), then the district would have returned to its 2012 voting pattern, when Democrats would not have taken 48% in an open-seat race. But Democratic strength in the district currently seems to reflect the 2016 presidential race, making the weighted average less instructive for the special election. The long and short of it is that an open-seat contest in GA-6 is exactly the sort of race the Democrats need to win in order to take back the House in 2018. So Handel’s victory should offer at least a little comfort to the GOP, though we are a long way from the midterm election. If Ossoff, an extremely well-funded and capable candidate, can’t improve on Democratic presidential performance in this district, then it shows that the Republican base can still put its candidates over the top in close races. Democrats have moral victories to point to, such as the closer-than-expected races in special elections in very red districts in Kansas, Montana, and South Carolina, but few actual wins of any sort — and none in House specials — to point to during the first five months of the Trump administration. As former coach/political expert Bill Parcells said, you are what your record says you are. The only way Democrats can spin a result like this as positive is by claiming that in traditionally Republican districts like this one Trump’s 2016 performance is also a GOP floor where the voters that flipped toward Clinton in 2016 will stay with the party, whereas Obama voters who voted for Trump are switching back to voting Democratic. One can argue that this dynamic can be seen in races like MT-AL, where the Democrat put up numbers similar to Obama in 2008. Perhaps there’s something to this in districts that didn’t swing toward the Democrats in 2016. Trump is obviously unpopular and GOP candidates are doing worse than they did prior to his election. And while it could mean reclaiming districts like ME-2, NY-21, IA-1, and IL-12 (blue-collar, rural, Republican-held seats that supported Obama twice and then Trump) is more likely, expanding the map to other seats that Romney won by 20+ like UT-4, TX-7, and GA-7 may be too difficult for Democrats to pull off. Ossoff’s loss is unquestionably demoralizing for Democrats. Enthused as they are, they still were unable to win the type of race they need to retake the House. But in politics a lot can change in 17 days, let alone 17 months. The GA-06 runoff is a snapshot of the national mood as of June 20, 2017, not Nov. 6, 2018. Robert Wheel (a pseudonym) is an attorney and University of Virginia graduate who lives in New York. He tweets at @BobbyBigWheel.